GAUSSplot 8.0 is no longer supported. 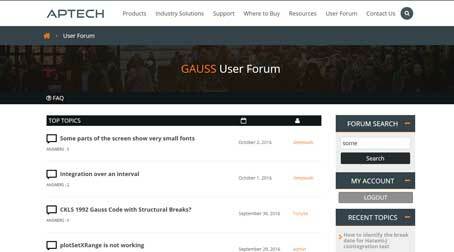 GAUSS now contains superior built-in graphics functions and capabilities. Contact Aptech Support for assistance on using the new graphics. To run the installer, browse to the location where the GAUSSplot installer was downloaded (usually your Downloads folder). The downloaded file should be named GAUSSplot_8.0_Win.zip, GAUSSplot_8.0_Win_GEPE.zip, etc. Double-click on the zip file and you should see the GAUSSplot Installer File. Double-click on this file to begin the installation. Follow the installer's instructions to complete the installation. Install GAUSSplot AFTER you have installed GAUSS/GAUSS Engine. If you have updated your GAUSS/GAUSS Engine to a newer version, you will need to REINSTALL your GAUSSplot into your new GAUSS/GAUSS Engine installation directory. GAUSSplot must be installed in a location in which the user has read and write privileges. The License file you receive should include license codes for GAUSS/GAUSS Engine AND GAUSSplot. Ensure that you place your License file in your GAUSS installation directory (usually c:\gauss19 on Windows or the directory where you installed GAUSS on LINUX). GAUSSplot example files are located in GAUSSHOME/gaussplot/examples directory. When you receive your permanent license, simply place it in the GAUSS installation directory. The default location is usually c:\gauss19 on Windows or the directory where you installed GAUSS on LINUX.